Two different artists did a charcoal sketches of my two Burritos. Mr. Burrito's sketch was done by a Filipino who lives in California. I thought she did an excellent job with every details. 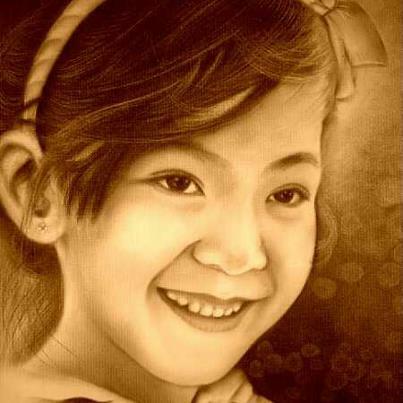 Ms. Burrito's portrait was sketched by a childhood friend of mine who is currently working in Dubai. Both artists have very different technique but I like them both! I wish that I have a talent like them lol. Thanks guys! You may contact these artists in their Facebook profile if you want your photo done. awwwwww...those are cute sis...very talented naman nila...I wish I have that talent. Wow very nice!! I have been wanting to have a sketch for my baby too. Both sketches are pretty awesome sis Rose. Each artist indeed shows their own style and they both did great. 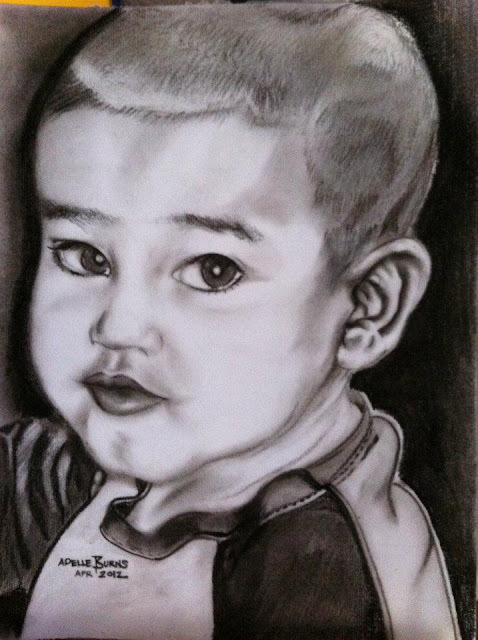 They've sketched every detail of your kids portrait. They really have different style ate Rose and they are both awesome! I would like to have one too but I think this type of art is quite expensive. Oh my that artists are very talented, I also wish to be like them.. Both artists are great.They did a good job.i hope somebody will do a sketch on my kids photos too. Oh, it reminds me of our mall way back in Davao City, i think it was in Victoria Plaza who have done charcoal sketching too. This is really great for gift giving. I wish i have done something like this on one of our family picture when i had my vacation in the Philippines. Have to admit that I favor the technique of the last charcoal sketch:) The Napels yellow gives it a soft glow to the face! 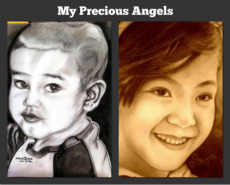 Very beautiful sketches of your kids. I like it a lot, and the artists did really a great job! Excellent sketches... Every artist has their own style...both are lovely. wow! amazing and unbelievable hehehehe. Those friends of yours are surely talented in sketching. That's a nice piece for your wall decoration. The sketches done of your children are terrific. Both artists did a great job. wow! excellent art work! I hope you also put the original photos from where they were copied so readers can see them too. Hi Rachelle, as per request, I have added the original photo. Thanks for the idea! The sketch of your friends were brilliant.They all look realistic works. Your kids are both gorgeous! I bet the charcoal sketcher loved sketching both of them! Beautiful! And, what a wonderful treasure to keep for life!